With half of Jet Airways fleet being grounded, India’s air travellers are feeling the brunt of flight cancellations and soaring airfares. In fact, with more planes being grounded by the day, Etihad announced on Monday that its partner Jet had cancelled all flights from Abu Dhabi to India. Jet operates several flights a day connecting Delhi to Abu Dhabi. 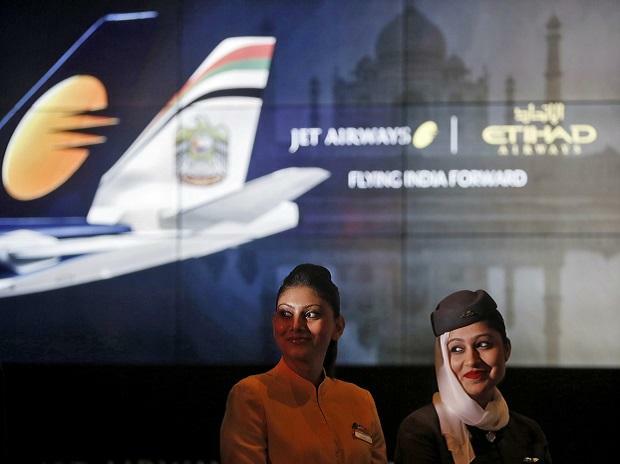 While Jet is bleeding, the repercussions are being felt on its partner Etihad too. The state-owned Abu Dhabi-based airline, established in 2003 by a royal decree by Sheikh Khalifa Zayan, has seen its market share in India’s international operations decline to its lowest level in recent years. In the third quarter (October-December) of 2018-19, the latest for which figures are available publicly, it touched a new low of 3.3 per cent. For the first time ever, Indian domestic carriers such as Spicejet and other international carriers like Oman Air command a bigger market share in India’s international passenger market than Etihad. Its embattled partner Jet Airways too saw its market share plummet to 11.9 per cent – its lowest ever recorded since aviation data is openly available in India. Etihad’s Indian ridership has been falling every single quarter in 2018-19. In October-December 2018, both Jet and Etihad have seen their ridership decline by nine per cent as compared to the previous quarter. The Etihad-Jet partnership had been beneficial for both airlines since Etihad bought a 24 per cent stake in Jet in April 2013 in a deal that reportedly worth $379 million. Before picking a stake, Etihad’s market share in India was two per cent. In the subsequent years, Etihad more than doubled its market share to and from India, capturing a big chunk of the Abu Dhabi passengers. Almost one out of ten passengers on Etihad are derived from India at present. But these good times seem to be coming to an end with Jet’s financial troubles. A more ominous sign for both Etihad and Jet hovers on the horizon as fewer travellers to and from India seem to prefer the Abu Dhabi route either for transit to as a final destination to the United Arab Emirates (UAE). Etihad operates international flights from India only to Abu Dhabi where it is headquartered and not to Dubai where the other UAE flagship airline Emirates operates from. Etihad connects Jet passengers to other parts of world including many cities in Europe through its Abu Dhabi hub. In the first quarter of 2018, the number of people flying from India to Abu Dhabi (and vice versa) fell 14 per cent as compared to the same period of 2017. The second quarter of 2018 from July to September, witnessed an even steeper decline. Infact in 2018-19, the number of Indian passengers to and from Abu Dhabi has declined every single quarter. This is perhaps the first time in several years that ridership to Abu Dhabi from India (and vice-versa) has declined so consistently both year on year and quarter on quarter. This decline also coincides with the period when the signs of Jet’s financial crisis started becoming more discernable. A precursor to this shift away from Abu Dhabi was visible a few months earlier. India’s civil aviation regulator’s data reveals that the number of passengers using Jet Airways to fly to and from Abu Dhabi fell almost 20 per cent in 2017-18 as compared to the previous year. In effect both Etihad, which flies only to Abu Dhabi and Jet which uses Etihad’s network at Abu Dhabi as a slingshot for its international operations seem to be suffering. While Abu Dhabi may be losing out on Indian passengers, Dubai seems to be the gainer in the Jet crisis. While Dubai has traditionally had the largest share of passengers from India to the United Arab Emirates (UAE), both Dubai and Abu Dhabi have seen good passenger growth over the years. For the first time in recent history, Indians flying to and from Abu Dhabi has declined every single quarter in 2018-19. In October-December, about 0.86 million passengers flew to and from Abu Dhabi. This was a decline of 12 per cent as compared to the first quarter of this financial year. In October-December 2017, almost 1.3 million more passengers had used the Abu Dhabi to and from India. Dubai meanwhile saw a rise in passengers to and from India during the third quarter of 2018-19 as compared to the first one. In 2017-18, Abu Dhabi saw a footfall of almost 4 million passengers - down 0.3 million passengers compared to the previous year. Dubai meanwhile saw almost 12 million passengers to and from India in 2017-18 – it’s highest in recent years. This was half a million more passengers than last year. Business Standard did not receive a response from Etihad till the time of publication. Even as Abu Dhabi is losing out to Dubai as one of the consequences of the Jet crisis, Etihad and Jet’s loss is a gain for many domestic airlines in India. While India’s largest domestic airline Indigo wasn’t flying to Abu Dhabi, it launched flights connecting Kerala to and from Abu Dhabi in October 2018. While Etihad does not connect India directly to Dubai, Jet Airways has several flights a day to Dubai. Since 2015-16, Jet’s Dubai ridership to and from India has grown 17 per cent. Indigo meanwhile has expanded its Dubai ridership at twice that rate. Infact, Indigo’s international ridership has almost doubled during this period – fastest among all domestic airlines in India that fly internationally. As of December 2018, Indigo’s market share of international passengers stood at 7.9 per cent – more than twice of what it was in 2015-16. Almost a third of all international passenger traffic from India goes to the United Arab Emirates (UAE).